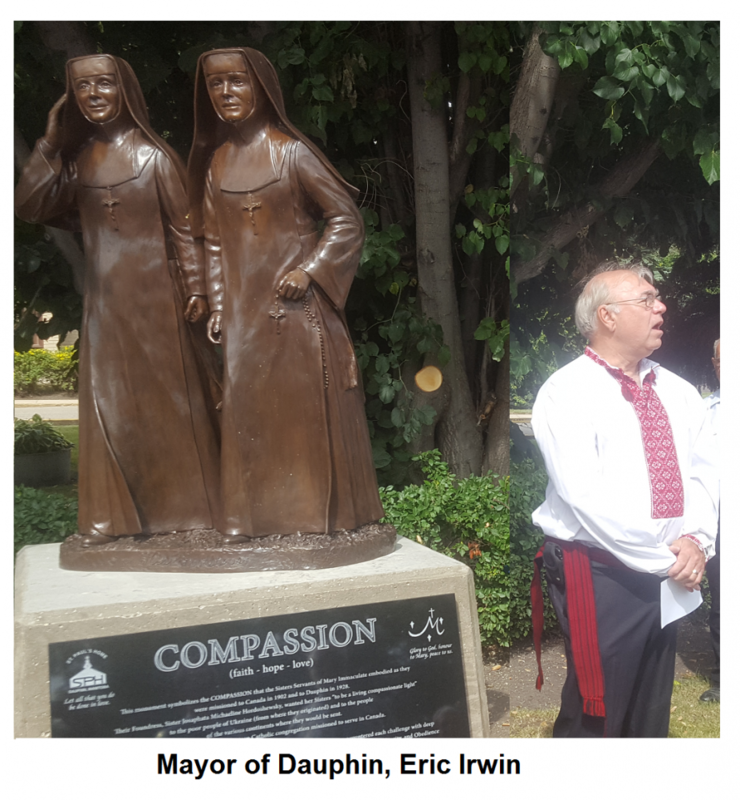 As part of a series of at least eight new monuments being placed around the city of Dauphin, the “Dauphin Bronze Project” unveiled its latest work on Sunday 31 July 2016. 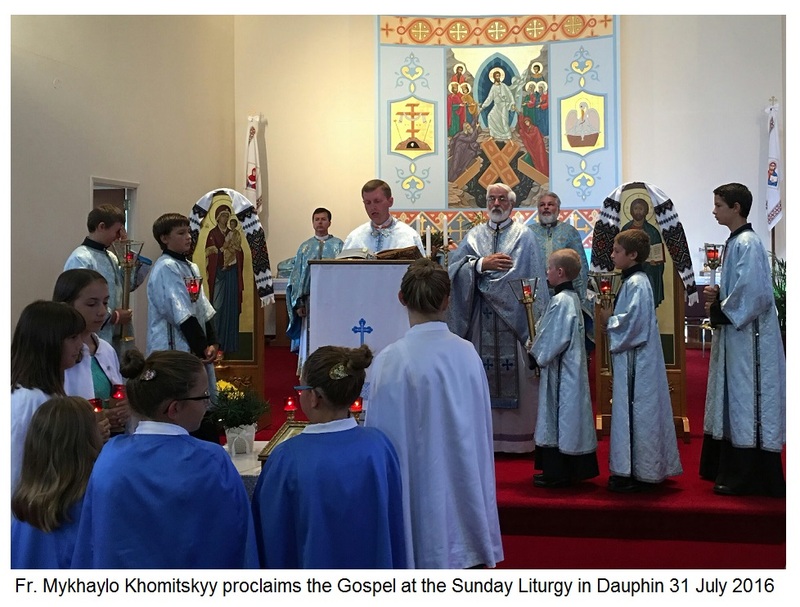 The day began with the Sunday morning Divine Liturgy concelebrated by the Dean of Dauphin, Fr. Oleg Bodnarski together with Fr. John Sianchuk, CSsR, Fr. Michael Kwiatkowski and Fr. Mykhaylo Khomitskyy. Following the liturgy, a procession was formed from the church to the monument site on Jackson Street in front the of main entrance to St. Paul’s Personal Care Home that, until recently, was operated by the Sisters Servants of Mary Immaculate. The excellent artwork depicts two Sisters moving forward in earnestness toward some pastoral mission. The plaque affixed to the base and entitled “Compassion” explains the underlying significance of the new monument. The actual unveiling was done by Canada’s National Ukrainian Festival 2016 ‘Hospodar and Hospodynya’ (hosts) Al and Sandra Dowhan. This was followed by a blessing performed by Fathers O. Bodnarski, J. Sianchuk and Fr. M. Kwiatkowski. Leading the singing were cantors Marvin Procyshyn, Ernie Sirski, Alvin Pentlechuk, Jason Gulenchin, Sister Darlene Pelechaty and the Choir. Music was also provided by Marvin & Mary Procyshyn and Manuel Nakonechny. Concluding remarks and an acknowledgement was spoken by the last direct of St. Paul’s Home and the last Sister Servant to be stationed in Dauphin - Sr. jean Zemliak, SSMI. The ceremony concluded with a singing of “God Save the Queen” and, finally, the Sisters Servants hymn. Also present was Sr. Nestor Kyba, SSMI who was the first administrator of St. Paul’s Home. 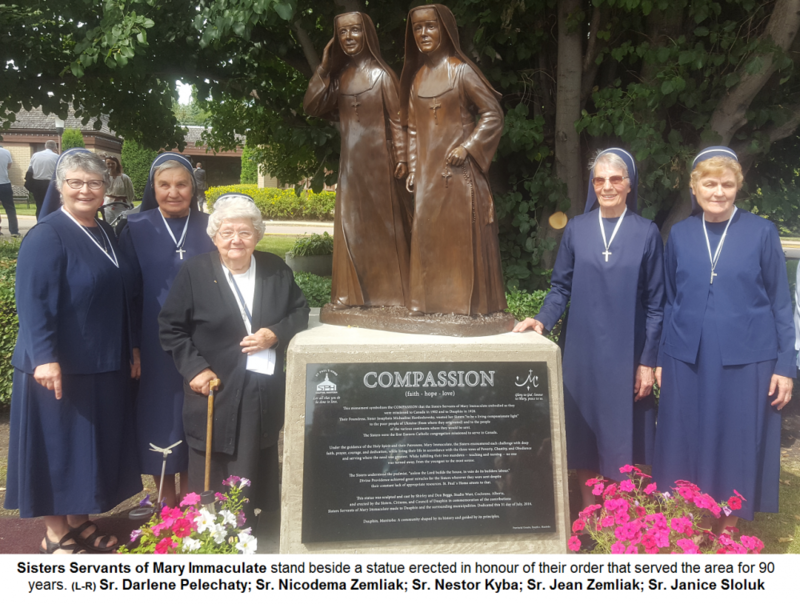 When the Sisters first came to Dauphin in 1928, they immediately start work with the poor and elderly. After using a classroom as a makeshift personal care home, they manage to purchase an old barracks building of the Royal Canadian Air Force for a whopping $2,500 and had them moved property that they had and transformed them into a more adequate St. Paul’s Home and officially opened it on 11 September 1949. In time a new facility was built and occupied by April of 1969. The newer St. Paul’s Home opened on 25 October 1970.